This study aims to investigate primary school students’ addition and subtraction based mathematical verbal problem solving levels and to identify the types of questions asked to students in mathematics course books. A form with problem types was administered to 158 third year students. Also, 6 mathematics course books and students’ books were analysed through document analysis. The results showed students had difficulties in initial unknown addition and subtraction problems and compare problems. In addition, it was found out that result unknown addition and subtraction based verbal problems were mostly used in the mathematics course books and students’ books prepared by the Ministry of National Education. It was also observed that compare problems were very scarcely used. Altun, M., Dönmez, N., İnan, H., Taner, M., & Özdilek, Z. (2001). 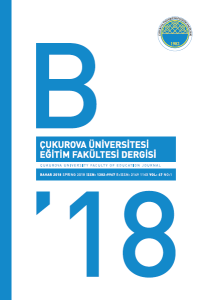 Altı yaşgrubu çocukların problem çözme stratejileri ve bunlarla ilgili öğretmen ve müfettiş algıları [Problem solving strategies of six age group children and school teacher’s and inspector’s perception of them]. Uludağ Üniversitesi Eğitim Fakültesi Dergisi, 14(1), 211-230. Artut, P. D. (2015). Preschool Children's Skills in Solving Mathematical Word Problems. Educational Research and Reviews, 10(18), 2539-2549. Carpenter, T. P., Franke, M.L., Ansell, E., Fennema, E., & Weisbeck, L. (1993). Models of problem solvıng: a study of kındergarten chıldren's problem-solvıng processes. Educ. Res. J. Res. Math. Educ. 24 (5),428-441. Carpenter, T.P., Hiebert, J., & Moser, J.M. (1983). The effect of instruction on children's solutions of addition and subtraction word problems. Educ. Stud. Math. 14(1), 55-72. Carpenter, T.P., & Moser, J.M. (1981). The development of addition and subtraction problem solving skills, In T. P. Carpenter, J. M. Moser and T. Romberg (Eds. ), Addition and Subtraction, Lawrence Erlbaum Associates, HiUsdale, NJ. Carpenter, T.P., Carey, D.A., & Kouba, V.L. (1990). A Problem–Solving Approach to the Operations. In Mathematics for the Young Child, J.N. Payne (Eds. ), National Council of Teachers of Mathematics, Reston, VA.
Davis, G., & Pepper, K. (1992). Mathematical problem solving by preschool children. Educ. Stud. Math. 23, 397-415. Fuson, K.C. (1992). Research on whole number addition and substruction. D.A. Grouws (Eds. ), Handbook of Research on Mathematics: Teaching and Learning. Newyork: Macmillan. Greer, B. (1997). Modelling reality in mathematics classrooms: The case of word problems. Learning and Instruction, 7 (4), 293-307. Manches, A., O’Malley, C., & Benford, S. (2010). The role of physical representations in solving number problems: A comparison of young children’s use of physical and virtual materials. Comput. Educ. 54(3), 622-640. Monroe, E., & Panchyshyn, R. (2005). Helping children with words in word problems. Australian Primary Mathematics Classroom, 10(4), 27-29. Nesher, P. (1980). The stereotyped nature of school word problems. For the Learning of Mathematics,1(1), 41-48. Olkun, S., & Toluk, Z. (2006). İlköğretimde Matematik Öğretiminde ÇağdaşYaklaşımlar. Ankara:Siyasal Kitabevi. Reusser, K., & Stebler, R. (1997). Every word problem has a solutions: The suspension of reality and sense-making in the culture of school mathematics. Learn. Instruction, 7,309–328. Tarım, K. (2009).The effects of cooperative learning on preschoolers’ mathematics problem-solving ability. Educ. Stud. Math., 72(3),325- 340. Van de Walle, J. A. (2001). Elementary School Mathematics, Teaching Developmentally. Addison-Wesley/Longman, Route 128, Reading, MA 01867. Van de Walle, J. A., Karp, K. S., & Williams, J. M. B. (2010). (7th ed. ) Elementary and middle school mathematics. Teaching development. Boston: Pearson. Yıldırım, A., & Şimşek, H. (2008). Sosyal Bilimlerde Nitel Araştırma Yöntemleri (7. Baskı) Ankara: Seçkin Yay.